My previous marathon attempt was aborted after completing three of the four-lap course. I was “doing OK” until the point about half way round lap three when I was no longer “doing OK”. It was quite demoralising, my first DNF (Did Not Finish). It showed me that I should have a little more respect for these events. I may have been able to take it in my pre-injured stride when I was in Ironman shape (probably the best shape I’ve ever been in), but you can’t just knock out a marathon willy-nilly – not without a more established fitness base at least. So, I’m going to try again. I entered the Rotterdam Marathon a while back. There are 18 weeks to race day (actually two days short of 18 weeks). On the recommendation of Martin Harris I got hold of Advanced Marathoning by Pete Pfitzinger and Scott Douglas. They present a number of different training plans for varying levels of ability. The plans are are divided by the number of miles you want to run each week. Each plan has an 18-week version, and a 12-week version. 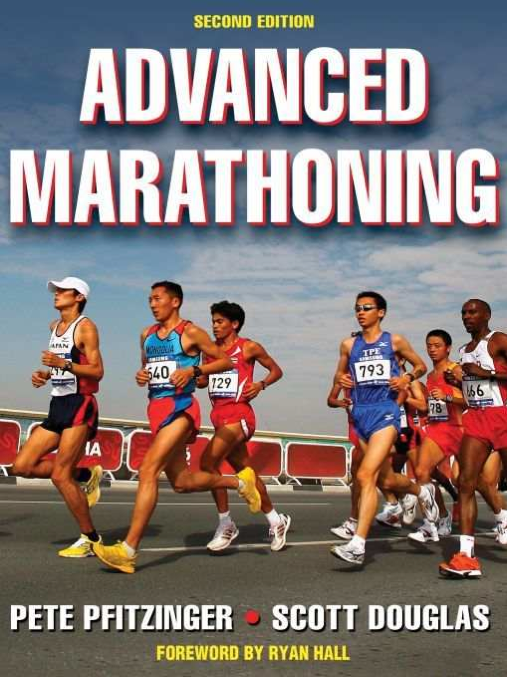 Additionally they also present a lot of material on the theory of running - nutrition, training, life balance, etc. I’m going to go in at the lowest level – and even that is 55 miles (88km) per week! I was initially considering getting stuck in to the 18-week plan, but as I’m currently averaging 10-20km per week I suspect that would be too much of a jump. Instead I’m going to follow the 12-week plan, and use the next 6 weeks to build up my weekly volume so I'm in a position to start it confidently and without risk of injury. So, this week I'm running 30km. Next week, 35km. Then 40, 45, 45, and finally a down week to recover of just 25km. Combined with a renewed focus on eating well, and twice-weekly trips to the great blokes at Athletic Edge I should be more run-fit come April than I’ve ever been before. This email also helps focus the mind! Besides, I made a silly bet with Mrs that I could break 3:30 in Rotterdam – I don’t know how practical that is yet, but I know I haven't a hope in hell without structured training! She’s running it too, and so is my friend Chris so it should be a good laugh, and give some focus to cold dark winter training. The race entry is paid. The flights are booked. The hotel is reserved. All I have to do is get there. Let’s go! Innovation Sports have been arranging runs on Clapham Common for a few years. I do the odd one, in fact my 10km PB was set there for quite some time - the first time I broke 50 mins (ran my heart out to creep in at 49:57). Originally a 10km over three laps they've revamped the course now into a 5km lap. Entries are open to those doing one, two, or three laps. Mrs ran one of the 15km events earlier in the year, I thought it sounded fun and the timing of this one worked well. The weather did not work well. It was pouring with rain. I suspect about half the field looked out of the window and immediately went back to bed. We nearly did the same. Mrs needed a run before her RRR adventure the next week (more on that later), so we stuck with it. We were going to jog round gently, but in the first few km she gradually pulled away. I decided early on, whilst slipping and sliding around (much of the course is off-road on grass or mud), to let her go for two laps, then run hard and try and catch her on the third lap. At the start of lap three I was about 400m behind. As the course was a complicated folded-up star shape I got a regular check of her position. In the first 2km or so I pulled back about 200m, but then just couldn't catch her. I later found out why - firstly, I only ran the first 2km of lap three any faster, I dropped back down after that; secondly, she had got herself in a race for a position and so was also trying to speed up. She was on a mission - I had no chance! End result: I was 42nd out of 83 finishers in 1:20:36, Mrs was two places in front of me in 1:20:00. Emergency coffee and rocky road slice in the café and we were done. Off home to warm up, dry off, and throw everything we were wearing straight into the washing machine. That's twice Mrs has genuinely beaten me now (this was the first time) - I'm going to have to re-double my training efforts! Started the Runderground project yesterday by running from Edgware Road to Wimbledon down the District Line. What an unexpectedly warm day, and a lovely run seeing some new bits of London. The aim is to run down every live in manageable chunks, from end to end. I took a "selfie" at each station - they're not the best pictures I've taken (to be honest, I look rough as hell), but it should make for an interesting collection by the time I've got them all. 13 stations down, many many more to go (and many of them will get visited more than once). A little project to mix up the routes - training should be fun! 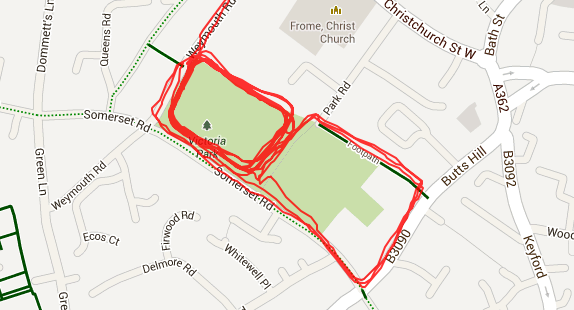 I joined Mrs on one of her pacing sessions yesterday. It's a fairly well established format, in fact there was an article on Triathlete Europe recently (that I can't find now, unfortunately) covering the principle. This session was a warm-up of 15 mins easy jog, then 5 repeats of 3 minutes at half marathon pace, 2 minutes at 10km pace, and 1 minute at 5km pace. No rest. After that, a 10 minute cool down. I looked on google maps satellite view to try and find somewhere flat - this is not a session to do up and down hills. I took some guesses based on recent performances that a realistic target half marathon pace is 5:30/km, 10km pace is around 5:00/km, and 5km pace a speedy (for me) 4:30/km. A bit hopeful maybe, but the session is about awareness - there should be a measurable change in speed with each stretch. The first good news is that there was a clear difference in my pace. However, I was generally slower than I was aiming for. Whether this is due to poor pace awareness or not setting realistic goal paces is the question. Right now, I suspect a bit of both. The number of right angles in the course we were following wouldn't have helped either. It didn't help that the park I found wasn't entirely flat, there were some gentle hills - but I can't really fall on that too much as an excuse. 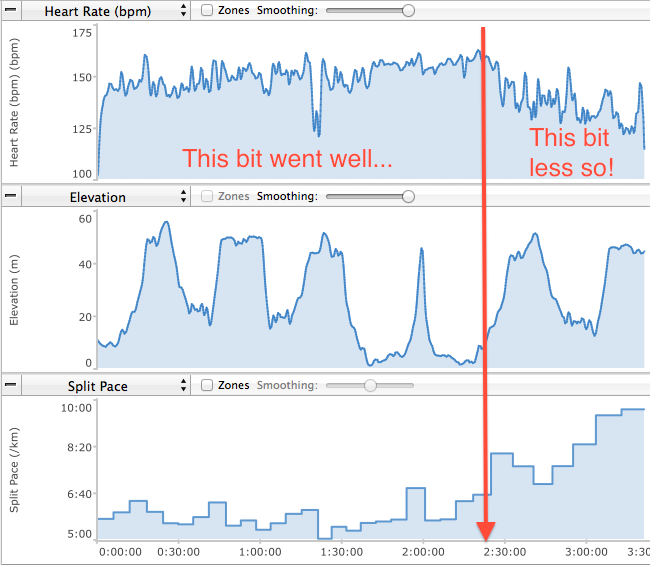 The trend lines tell the story - I was generally slowing down - apart from the 5km sections where it felt like I was going to vomit up a lung. An interesting experiment. I will repeat this session regularly until I can more accurately gauge and sustain paces - it's an incredibly useful skill to develop. A long-ish slow-ish run was on the cards for today, but we don't know the area. So last night I looked around on t'Internet for some trail run routes. I stumbled across the Frome Running Club site (they've been running since 1981, apparently - I'm assuming not continuously). On their site I'm pretty sure there was a link to the Malmesbury Half Marathon page - though oddly I can't find it now. 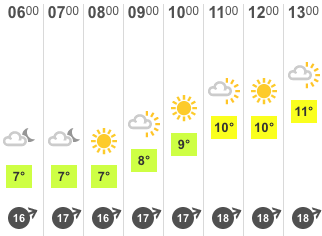 Local half, £20 quid on the day, a bit hilly and pretty countryside. Perfect. It was decided. So we drank two bottles of wine, I bought an iPhone (drunken purchase and a half), and turned in for the night. Up at 6.30am (on a Sunday? We are on holiday, right? Yes? OK just checking) and off to Malmesbury. Uneventful drive apart from the bit where I drove down a road too narrow for the car and had to reverse back up a steep hill with pointy walls on each side, trying to keep it together while Mrs did a saintly job of directing me. Learned that my car far prefers going forwards, and also that burning clutch is quite an unpleasant smell. I was going to try the run fasted (like yesterday) but the bacon smell from the refreshments booth was far too hard to resist. One bacon roll each, and a pretty good cup of filter coffee. The start was up in the town, so after a brief race briefing we were led up en masse. The Mayor of somewhere started the fun, and with a "Go!" we were off. Mrs and I had vaguely discussed a race plan. Firstly: It's not a pedal-to-the-metal race, it's a training run. We're not out to kill ourselves, so take it easy. Secondly: A negative split would be nice (covering the second half of the race in less time than the first half). Finally: Try and keep at around 6min/km, maybe a little below. As we set off the tide of other runners all ran away from us. This is normal, everyone starts too fast - it's hard not to get carried away. We were a little too conservative on the second km and picked it up a little bit. We passed the 10km timer at 59:29 - under an hour is fine. Good pace. It's unfortunate the "mid-point" timing mat was on the 10km line, the 10.55km point would have been better (a half marathon being 13.1 miles, or 21.1km). We'd already regained some places - the middle of the race is when most people of similar ability are at an equal pace, though the ones who really went out hard are starting to slow already. At about 8 miles she got a move on and started pulling away - can't let that happen! From there on we just got faster and faster. As everyone was slowing down, we were getting faster. I pulled her back and ran with her again - we felt good! Strong! This is fun! Mrs pulled away again with a couple of km left, I worked hard to hang on - she was flying! I finally caught her again as we got back into Malmesbury. I had a good rhythm so pushed on past, opening up a small lead to the finish. I finished in in 02:02:44 for 174th place (of 248 starters and 243 finishers), 126th man (of 153) and 48th in my age group (an unusually wide group, M 20-39). The results put me in 202nd place at the 10km mark, so I ran up 28 places in the final 11.1km - no the results don't set the world on fire, and it's a long way from my 1:40:30 PB - but for a spontaneous post-injury training run, I'm happy with that! A handshake from the Mayor, an unexpected finishers' medal, some sneaky cake and a glorious cup of tea, and we were done. Very happy indeed with that spontaneous little outing. Malmesbury was lovely. Friendly people, pretty village, and a beautiful half marathon route. It's the second year the race has been held (was 6C and a thunderstorm last year apparently!) and I'm sure it'll become a regular fixture on the local athletics calendar. Me and Mrs are on jollydays this week. We've come to Frome (apparently pronounced Froome, as in Chris) in Somerset to relax (although somewhat predictably the car was mainly full of bicycles, shoes, and sports clothing). We drove down after work yesterday and today was our first full day - it's Saturday, and that means parkrun day. 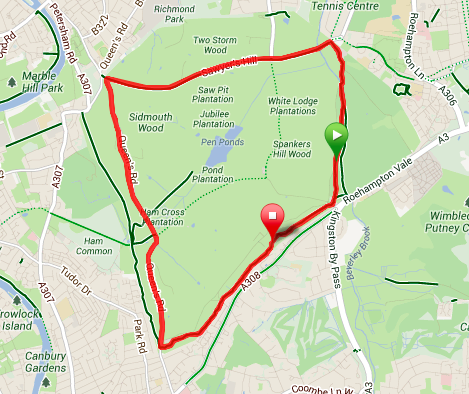 The nearest parkrun is Southwick Country Park parkrun, a 30 minute bike ride from where we're staying. Up and off, slightly foggy head after an unexpectedly good meal and wine at The Archangel (we'll be back there for sure - incredible onion rings), and with google guided navigation chattering instructions from my chest pocket. We got there with 10-15 minutes to spare. Today's Run Director, and overall Event Director, Sean Price came and introduced himself. He explained Southwick Country Park parkrun was just over two years old, and told us about the course route. When I said my home run was Wimbledon Common he remembered Abradypus coming down for their inaugural run (and he was right, she did!) - good memory, Sean! He also said he recognised my name from somewhere (uh-oh!) and knew about my blog. We talked about parkrun tourism a bit, I just love trying out different parkruns. 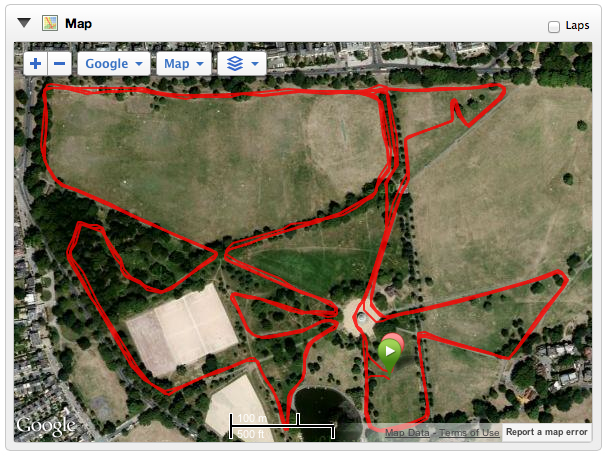 Today was my 79th parkrun and my 64th different course (including 26 inaugural events). Some people are far more accomplished parkrun tourists. There's a most events table, and I'm a long way from the top! Ordered by number of different events I'm languishing down in joint 26th place, but ordered by inaugurals attended I sit 9th. The run went very well. Mrs and I ran perfect 25-minute pacing for the first 3km (5:00, 4:57, 5:00) and then I wound it up a bit to cover km 4 in 4:42 and then km 5 in 4:36 (Garmin data here). This was my strongest and best managed performance since injury. With an official time of 24:27 I ran faster last week at Southwark in 23:36 (but I measured that as 120m short, so I was on 24:12 5km pace really) but had it all on the line in terms of effort, I was far more comfortable this week. We cycled there (and back) and ran "fasted" (no food, only water and black coffee). Fasted sessions encourage your body to burn fat as a fuel rather than relying on carbohydrate stores. I was very pleased that I felt no loss of energy throughout the morning - I must go and get myself tested at some point. Mrs did it recently - her blog on it is a fascinating read. £2 for toast'n'tea? A pleasant change from London prices! After the run we enjoyed a cuppa at the wonderful little café. There's a really strong sense of community at this parkrun - lots of encouragement (it's always a good sign when the early finishers stay around to clap everyone else in). I asked Sean if Danny Norman (presenter of The parkrun Show podcast) had been down, but although he's been invited a few times he's yet to get here - come on Danny, I think you'd love the community here! Thank you to Sean and the team, you made us feel very welcome indeed - particularly with the "come on, Wimbledon!" encouragement. This certainly have a wonderful parkrun, I look forward to running it again one day. When Mrs won a competition to race and train with Team Freespeed for a season she also got entry into the London Triathlon. This is an annual event for Team Freespeed, and they generally perform very well (that’s a bit of an understatement!). We had an enjoyable weekend there, I really enjoyed the race, as did she, and we met most of the team and sponsors. I raced the Olympic Plus distance with some of the team and had a good day. I thought that would be my only insight into what racing with a real team of high-performing age-group (amateur) athletes would be like, but quite unexpectedly she also received an invite courtesy of Virgin Active UK to fly out to Valencia with the team for a couple of days together with entry into the Valencia Triathlon – and I got to go too! That’s why, on a cool rainy Friday morning, we found ourselves shuffling the bike boxes around again on our way to another airport. We met up with Richard Melik, owner of Freespeed bike fitting company and team manager, his wife Jenny, their adorable twins Noah and Leo, Freespeed athlete Stuart Anderson and his wife Mette, (also the team’s administrator), David Risebrow and his wife Steph, and Nick Stocker who is Sponsorship and Partnership manager for Virgin Active UK and our liaison for the weekend. In the hotel we met up with a further Team Freespeed athlete Matt Malloy and his wife Helen. Quite a party! The weather in Valencia was beautiful – we left Gatwick in 14C and a rain storm, we arrived to almost 30C and a perfect sunny day. After some fun trying to get all our bike boxes and luggage into taxis we checked into the hotel and strolled the 25 minutes or so down to the beach-front. A few of us went for a dip in the sea and pointed at jellyfish – a world apart from London! Saturday we took it easy – most of the team went out to look around the old town, but Mrs and I had a lazy day. 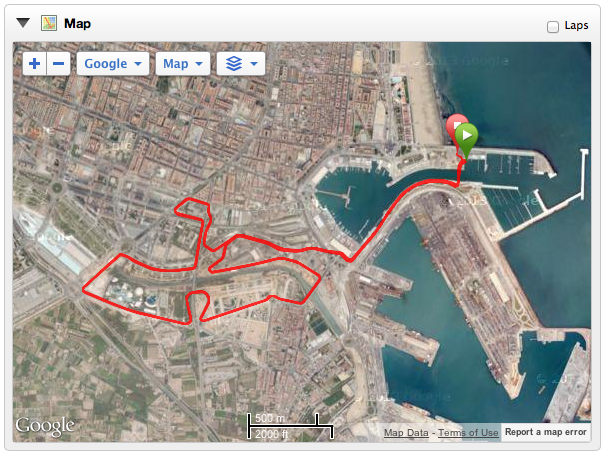 We put our bikes together and cycled lazily down to the marina to see what was going on. 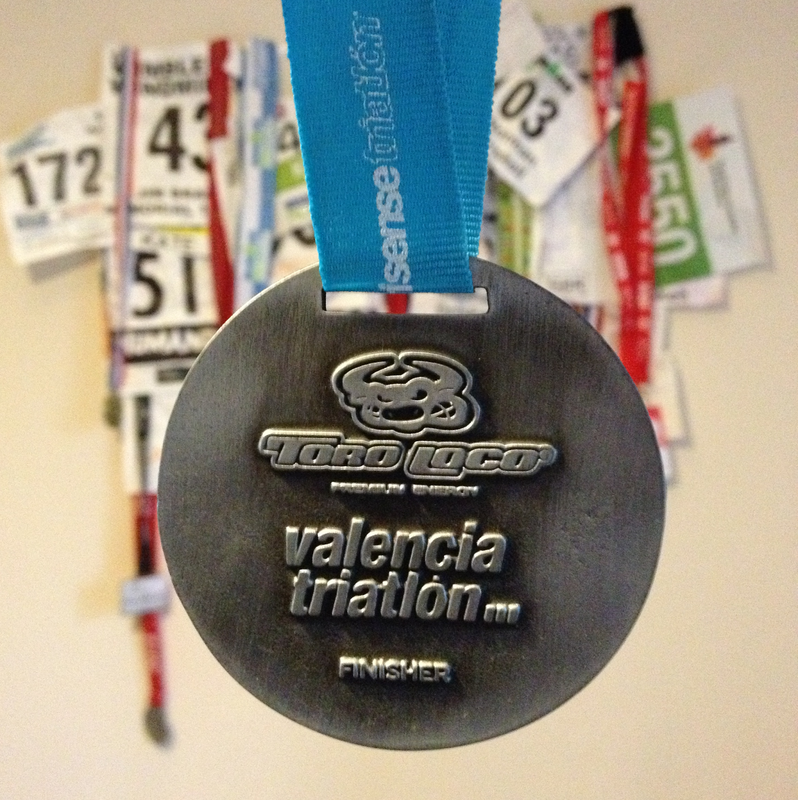 The Valencia Triathlon is in its 4th year and spreads across the weekend with around 1,700 people racing each day. It was mainly sprint and super-sprint distance Saturday, with Olympic distance on Sunday. We were all racing on Sunday, but in different waves. The expo area was small and quite crowded. We tried to register but it was too early. Bikes now confirmed as working, and circuit checked out, we headed back to the hotel for a nap (which accidentally turned into a good few hours sleep). The whole group went back down at about 6pm to register. The queues for registration were short, but the queue for collecting timing chips was huge! It spiralled around the entire expo area, coiling in on itself confusingly. The queuing etiquette was distinctly non-British with much queue-jumping and pushing in! We had to rack our bikes but weren’t allowed to leave anything else in the transition area. Race day rolled around with a 6am alarm call, and we headed downstairs for breakfast. The hotel was serving from 6am, an hour and a half earlier than usual on a Sunday, due to all the athletes staying there who needed to get out early. Every competitor had to lay out their transition area out between 07:00 and 07:45 so regardless of which start wave we were in we all needed to go down at that time. I was the first of the group to go off at 08:20, with Dave Risebrow in the wave behind me at 08:30, so I didn’t have much standing around to do. I barely had time to take advantage of one of the very small number of portaloos before it was time to get in the start pen. For future reference: Avoid the portaloos at all costs. There are nowhere near enough of them and they aren’t cleaned or emptied between Saturday and Sunday. Not a joyful experience! The course is in a fantastic location with excellent access and viewing for spectators. 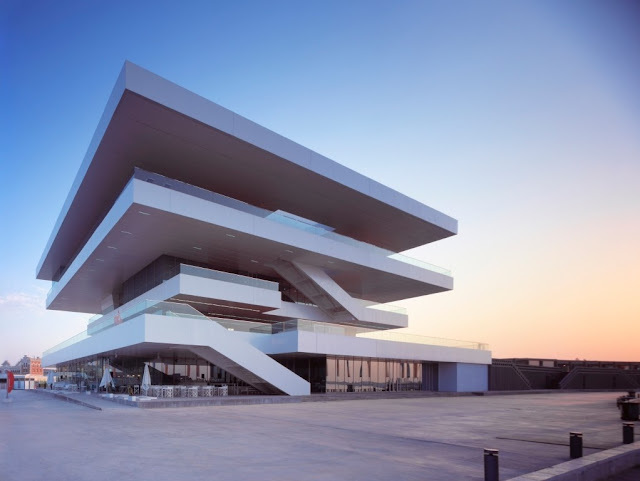 Right in the heart of the Valencia Marina, it’s in the same location as the Formula 1 circuit. Mrs and I had been here before in 2010 for my birthday (the year MarkWebber tried to take off). My wave collected in the start pen eagerly – let’s get going! A final briefing in Spanish that I didn’t understand a word of, and we were off down a ramp to plop into the water. I jumped in and set about acclimatising myself. I was understandably cautious going into the swim – I really didn’t want a repeat of last week’s freak-out in Austria, particularly with the Team Freespeed crew watching from the shore. The water was very warm so it was compulsory non-wetsuit. I’m not currently sure if my sudden panics are due to the cold water, wearing a wetsuit, the fact there are so many people around me, or something else. I positioned myself at the back and floated around a bit waiting for the off. At 08:20 on the dot a gun sounded, and we were off. I decided I wanted to start slowly, be as calm and relaxed as I possibly could, and hope that I was OK. Thankfully there was no repeat of last week. I gradually wound up the effort over the first half of the 1,500m course, and by the far turn buoy I was moving up the field. I hadn’t looked at the course closely enough so wasn’t sure where the exit was, I relied on following a mid-pack group and trusting the collective sense of direction. That worked fairly well, and I even jumped a few gaps from group to group. One day I’ll learn to start hard without a panic-attack and my swim times will improve appreciably! The water was a perfect temperature. The high salt content made the swim very easy. There was a bit of jostling and a few periods of contact but in general the swimmers were considerate about their space. I’d expected a bit more of a bun-fight, so this was a nice turn-up. Towards the end we swam under the famous swinging bridge of the F1 circuit, and after an acute left turn round a final buoy I could see the red carpet of the exit ramp. I’d been jostling a guy for the last few minutes and decided I was going to beat him in the last 100m, so opened it up a bit and came out a couple of lengths ahead. I’d had a little facebook banter with Mrs before hand about who would win the swim between us - thanks mainly due to that push at the end I took the win in 28:20 compared to her 28:55. There must have been some current helping me somewhere as 28:20 is a huge PB for me over 1,500m. From memory I’ve broken 30 minutes just once before, and that was only by a couple of seconds. I felt good coming out of the water and all fired up ready for some fun on the bike. A great start! 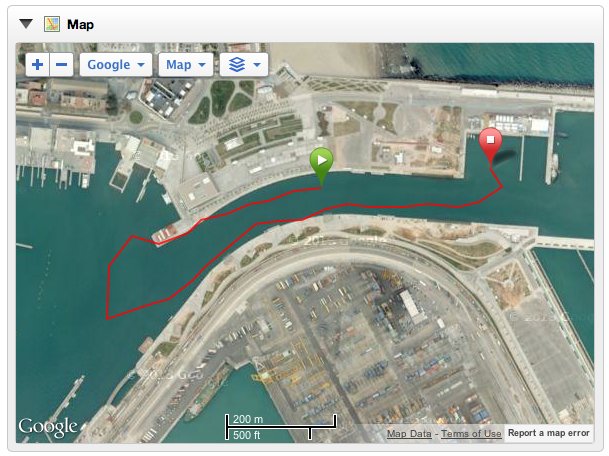 With no wetsuit to remove, T1 was uneventful. After picking up a blister on the run last week I decided to take the time to pop some socks on. As I was racing my road bike rather than my TT bike I didn’t have any loops on my shoes to attach them to the frame, so I had to put those on too and run out to the mount line in my cleats, clattering and skidding as I went. 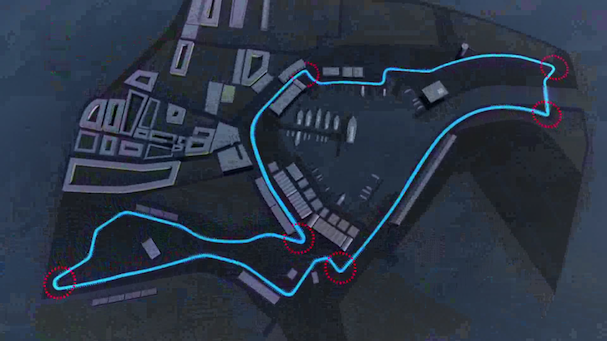 The bike course is four 10km loops that take in a few km of the Formula 1 circuit before branching off into the town, over a couple of bridges, through what looked like a disused car park, and then back onto the F1 circuit. The course was fairly flat, a few lumps and bumps with the only rises being over the bridges. The road surface was generally very good although there were some gratings, manhole covers, and at one point some sand to make the corners interesting. There were quite a few right-angled turns to keep it interesting. The most exciting thing is that this was a drafting race. Normally the bike component of a triathlon is non-drafting – this means you have to make sure there’s a certain minimum distance, normally 10m, between you and the bike in front with overtaking manoeuvres need to be completed within a time limit, typically 15 seconds to overtake and 15 seconds for the overtaken rider to drop back again.. This is why most triathlons are ridden on fast aerodynamic time-trial bikes. In a drafting race there are no such restrictions. Everyone rides road bikes and you can be as close as you like to the bike in front (therefore gaining an advantage by being in his slipstream), and if someone wants to sit on your wheel to get an advantage, they can do. I shot off out of transition full of excitement; I’d really been looking forward to this. I immediately came across a couple of groups and decided they were going far too slowly for my liking, and shot past them looking for a pack going as fast as I wanted to go. I went round most of the first circuit alone, before getting into a group just before the start of the second. Generally when you ride in a big pack it’s good form to take turns on the front. There’s no advantage in the front so it’s harder to keep the pace. With each rider taking a turn for a minute or two, the whole group can make better progress without tiring out. My turn came and I put some power down, I checked over my shoulder and I’d dropped the lot of them! Oops. They caught up and swallowed me up, then my turn came around again and the same thing happened! This probably wasn’t the right group for me. Constant high heart rate all the way, check 40-50min - I finally got a drafting advantage! I jumped off the front in search of some new friends to play with. For about 50% of the second lap I pushed hard. Racing on my road bike was great fun – it’s so much more nimble than my TT bike, and I feel a lot more comfortable flicking it about and through corners. I found a new pack and had to work hard to stay in it – this was more like it. When my turn at the front came I couldn’t drop them this time, instead I put in some real effort and had a snake of about 20 people behind me for a quarter of a lap. Someone else took over and pushed hard. By the end of the third lap there were just 4 of us left, all working well together. Everyone else had slipped off the back. Loved it. 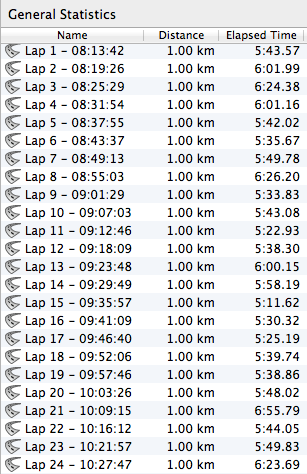 Two of the remainder were from an earlier wave and so pulled off into transition at the end of the third lap. Me and my new friend pushed on for lap four, picking up a couple of stragglers along the way. We exchanged mutual respect statements and back slaps at the dismount into transition – I don’t think we had a common language (other than cycling). This was my first experience in a drafting race and I absolutely loved it. You work yourself so hard that you can hardly breathe any more, and then get to recuperate by tucking into a pack, before taking up the reigns and doing it all over again – brilliant, I highly recommend it. I think you have to be strong on the bike though, and confident in a group - probably not for the feint-hearted. Full of adrenaline and excitement I ran through T2 quite quickly. A change of shoes, a quick gel (High5 EnergyGel Plus caffeinated orange – tastes disgusting and metallic but I figured I needed a bit of a boost going into the run), and I was off again. 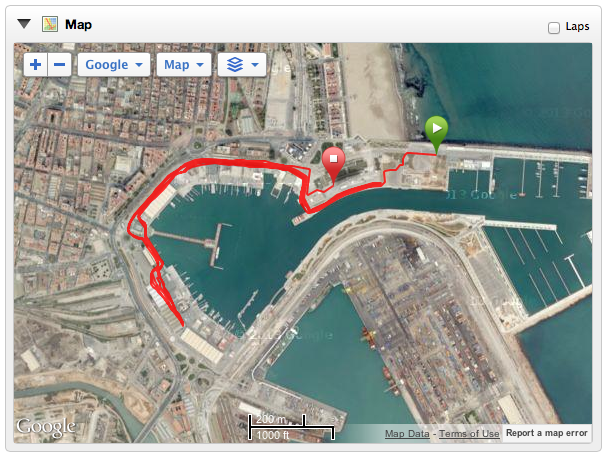 My run plan was simple: Firstly, try to run rather than shuffle along – it’s not an Ironman, you’ve only got to go 10km. Second, listen to my knee – if it even begins to hurt like last weekend, stop and stop immediately. This race was never planned; if I need to DNF to avoid an injury then I must do so. Thirdly, try and get in under an hour. The run course was a simple three-lap circuit with a lead-in from transition and a lovely finishing segment round the amazing building with the Mar de Bamboo restaurant in it. Today it was being used as a VIP bar area during the race – and at the F1 events it’s inside the circuit and very exclusive indeed. I tried to remember that I’m not “run fit” so I know my time will be slow in comparison with 10km PB performance, but let’s just see what happens. My legs felt surprisingly good after such a thrashing on the bike, and I set off at a healthy pace. The first km ticked over in 5:24, not bad. It’s now around 10am and the sun was firing up its afterburners. The temperature was rising sharply and some parts of the run course were very exposed with nowhere to hide. I had a bit of stomach discomfort in the first half, but I knew it would pass so pushed on through. I was managing to stay under 6min/km and was comfortable with that. In the second half I even overtook a few people, a rarity! My solid consistent pacing was paying off and I was overtaking those who had gone out too hard and were now paying for it in the heat. My knee had niggled me a little bit, but only once or twice and it certainly wasn’t hurting or aching – I continued to push on. With 3km left I turned up the effort. I didn’t seem to get much faster, but at least I didn’t slow down. I eschewed the final pass of the aid station and focused on the finish. The final 200m took us up a long carpeted ramp, round the base of the VIP building in the marina, and then down a ramp to the finish line. I was not looking forward to the up-ramp and was pleasantly surprised when it turned out to be made of sprung wooden slats and I could sproing up it without much effort at all. There was an athlete ahead of me who had started his celebrating half way down the finish ramp, so with a final push I accelerated and overtook him a few metres before the line. A bit cheeky, but the race isn’t over until you cross the line and every place counts! From his number I think he was in my start wave too. The finishing area was excellent with a veritable feast for the hungry athletes. We snaked through some counters with water, Amstel Lemon beer (nice for the first couple of cans, and very refreshing, a bit sickly beyond that), and Toro Loco energy drink - then had a choice of melon slices, pastries, sweet and savoury pasties and more. There was no urgency to push through so we could have as much as we wanted including going back for seconds. The big win was that beyond the refreshments tables was a large square concreted area reserved for finishing athletes. There was all the room you could need to cool down, stand in the shade, stretch, and chat to fellow competitors. This was a far better experience than last week where after a race of twice the length in harsh conditions the disoriented finishers were shunted out into a tiny area crammed full of people. You can learn from this, Ironman – get some more finishing space, it makes a huge difference to the race experience. This is a race I would definitely consider again – the circuit is good and fast, and the drafting element makes it very exciting. If it falls a week or two before Ironman Wales next year it’ll be a great warm-up race, however I think it might clash – this year they were on the same day. Mrs went off later. She was 3rd in her wave in the swim but suffered some really bad luck on the bike with a blowout in the front tyre just 10m out of transition. She had to abandon there and then – a real shame, but these things happen. Better that it happened this week in a C-Race than last week in Austria or next week when she’s racing on home turf on the famous Hyde Park course in London in the open sprint competition. The rest of Team Freespeed had good days. Matt Malloy won his age group, Jenny came third in hers and fourth woman overall, and David and Stuart raced well too. Richard, Mette, Steph, Helen, and the kids had a great day in the sun soaking up the atmosphere and watching the races. Afterwards we went to a bar on the beach-front for a few well-earned beers and food. We fixed Mrs’ tyre and cycled gently back to the hotel. We all met up and ate together in the evening, with some tipsy banter and good laughs. What a lovely day! It was fun feeling like part of a team for the weekend. I must give huge thanks to Team Freespeed and Virgin Active for the opportunity. Maybe one day I’ll get to have this kind of experience based on merit – got quite a long way before that happens though!